Thai massage originated in India and came to Thailand about 2,500 years ago when Buddhism began to spread to the East and physicians working with Buddhist monks brought their form of massage and herbs to Thailand. Thai people honour an Indian man by the name of Jivaka Kumar Bhacca as the founding father and practitioner of Thai Massage. In 1764, Burmese invaders destroyed most of the holy scriptures and the diagnostic aspect of the massage was lost. Some scriptures, however, were left on pali leaves and later the Thai government used these to depict energy lines on stone tablets which can now be seen in Wat Po, Bangkok. Thai massage has a somewhat fragmented history and is now mostly a verbally communicated form of bodywork. Massage in the East has always been more highly valued for its healing powers than in the West and in Thailand it is used by lay people all over the country to treat almost any condition. Traditional Thai massage is done fully clothed on a futon on the floor. Thai massage focuses more on the energy body of the person rather than the musculature. The energy system - a mixture of the Chinese ‘meridians’ and the Indian ‘nadhis’ - focuses on 10 key energy channels, called ‘sen’ in Thailand. Acupressure points along these meridians are pressed and stimulated to increase energy flow and relieve pain. There is no kneading of muscles as in Swedish massage; instead the practitioner uses a series of rhythmic manipulations to press the energy points using thumbs or elbows while applying broader pressure with the palms of the hands and sometimes the feet. 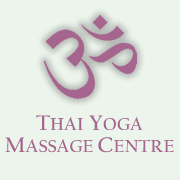 It is often referred to as Thai Yoga Massage because the treatment involves many yoga-based stretches to stimulate and rebalance the body’s natural flow of energy. This stimulation and balancing of the body’s energy flow is what makes Thai massage so effective, helping you to feel energised and more flexible.